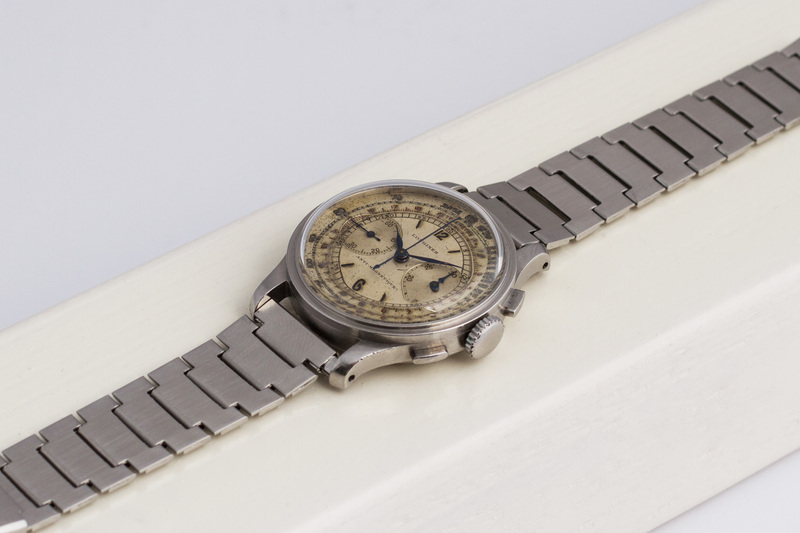 We are more than excited to be offering you this extremely Rare, Iconic and Legendary Longines 13ZN Flyback Chronograph Wristwatch from 1942! The 13ZN movement is one of the best and most beautiful movements ever made! The fact that the 13ZN was a big inspiration to Lange & Sohne should tell you enough about the high quality of this Flyback Chronograph. This 13ZN is a 17 jewels movement which beats at an 18.000 vibrations per hour and is equipped with a Brequet hairspring for higher accuracy. 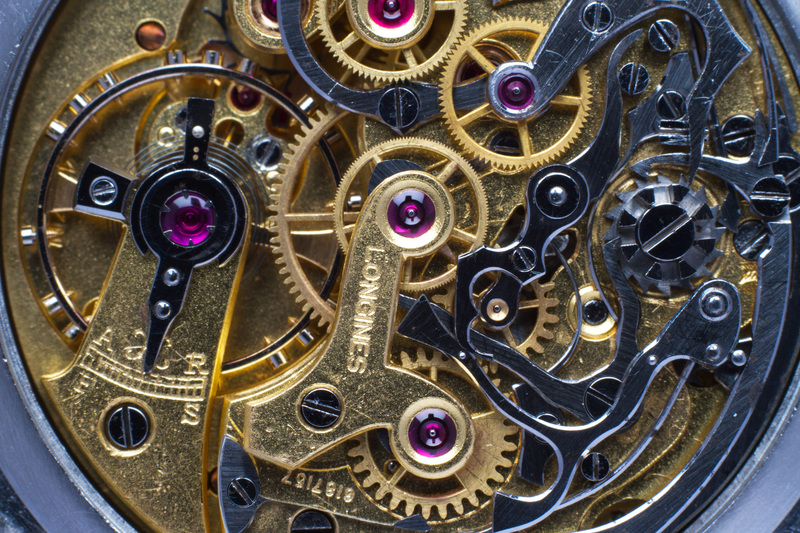 The Chronograph function on a 13ZN movement also features another complication called a Flyback. With a Flyback Chronograph it is possible to reset the chronographs center-seconds counter-hand, back to zero without stopping it first. After pressing the reset button, the counter hand swings back to zero and will immediately start a new timing run. This enables the person wearing the watch to time events much quicker than with a conventional chronograph. 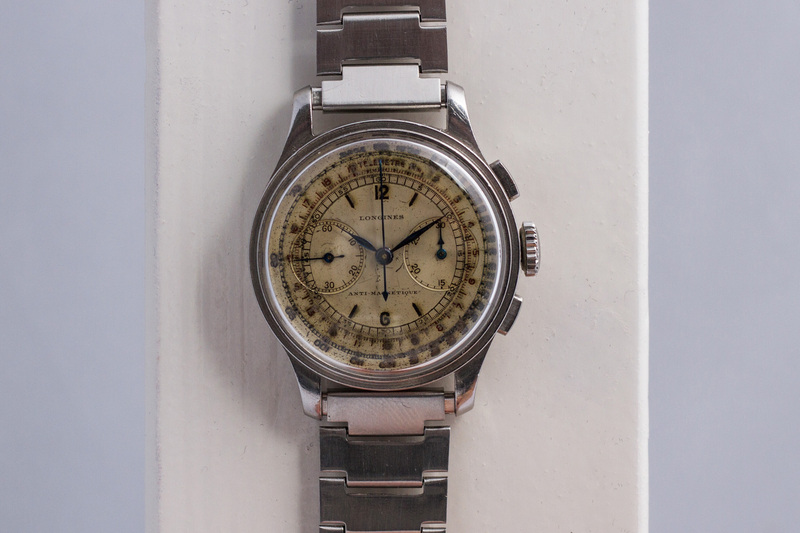 Back in the 40’s and 50’s this was very important and sometimes live saving as these watches were used as navigation tools by pilots and by the military for timing artillery. 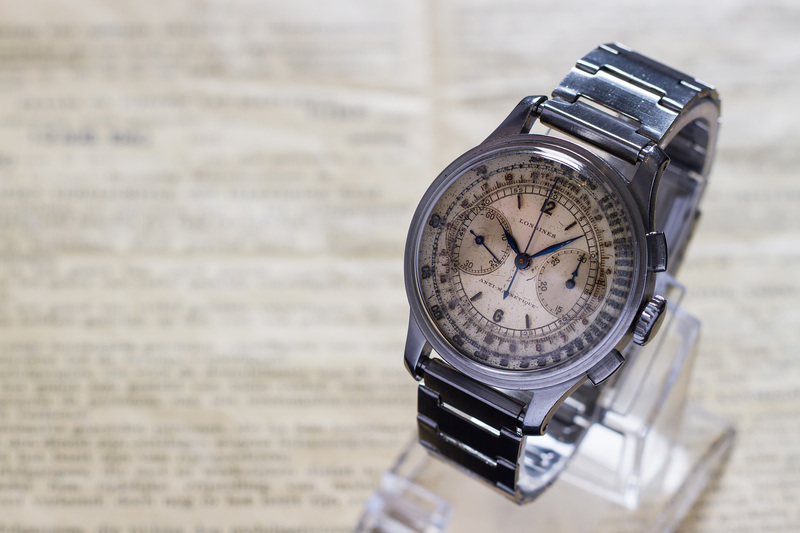 Longines was way ahead of their time as no other company even tried to manufacture an Flyback Chronograph until 20 years later! 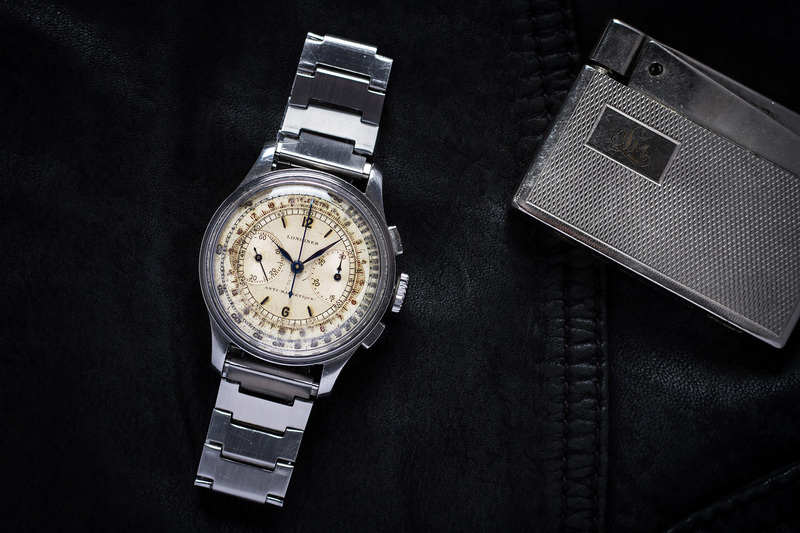 The case on this Longines is a so-called step case, referring to the two small steps on the stainless steel bezel. There are step-case watches around with a much fatter ‘step’ but the modest step on this 13ZN is just perfect and fits the watch, and its overall appearance well. 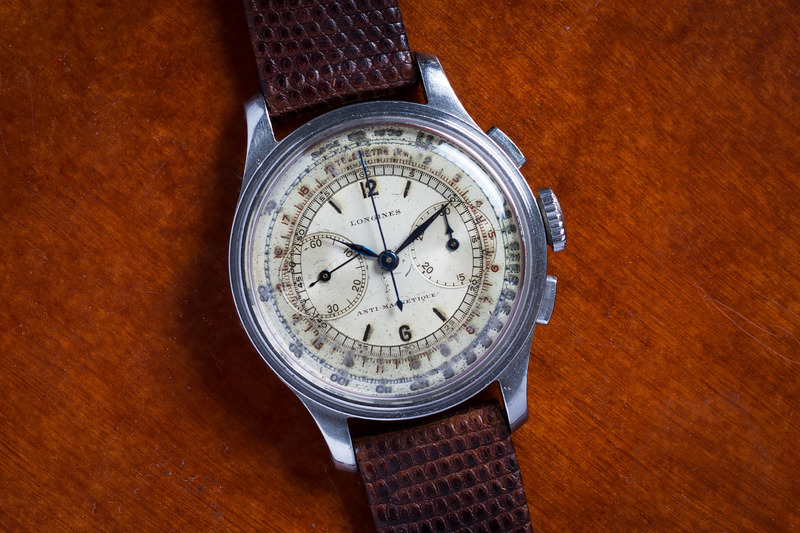 These type of cases are truly attractive to most watch collectors and are characteristic for the 1940’s (chronograph) design of watch-cases. The step case features a stainless steel ‘snapback’ case-back. 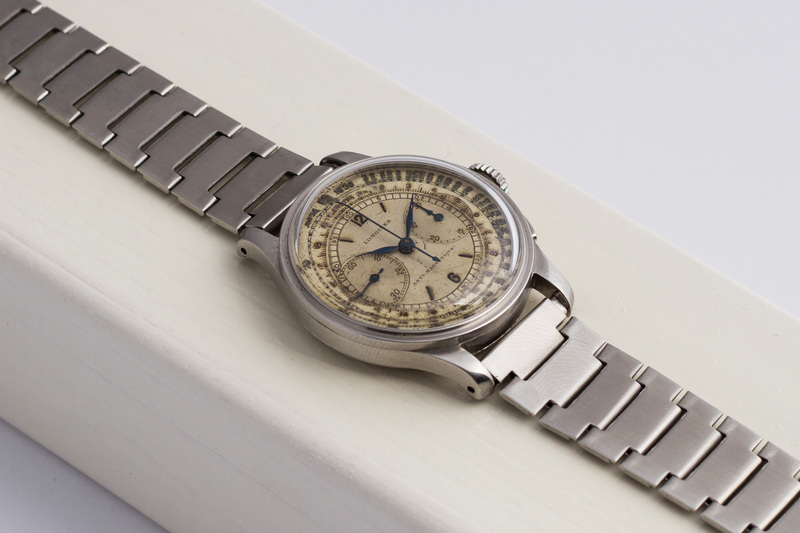 Apart from the fact that the dial has a 500 base Tachymeter scale on the outer edge for the use of the Chronograph Flyback, it also features a Telemeter scale more positioned to the center of the dial. Originally, the numbers of the Telemeter scale were featured in the color red. Due to aging, the red partially wore off but if you look closely you can still make out this color. The original meaning of Telemeter, and still one of the main uses of the word, is a device used to measure distances to remote objects, kind of like a rangefinder. Telemeter scales on watches in the 1940’s soon found military applications in range-finding, especially for naval gunnery. It was mainly used to determine the distance in km’s between the sound of the shot from a canon, to the impact of the round. 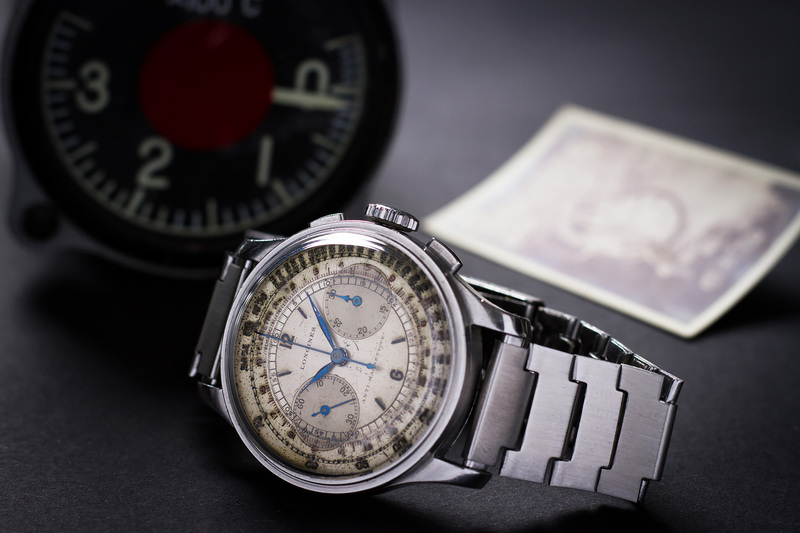 Besides the lay out for these complications the dial also features two ‘Big Eyes’ which are used as the sub-dials for the seconds hand and 30 minute chronograph counter hand. 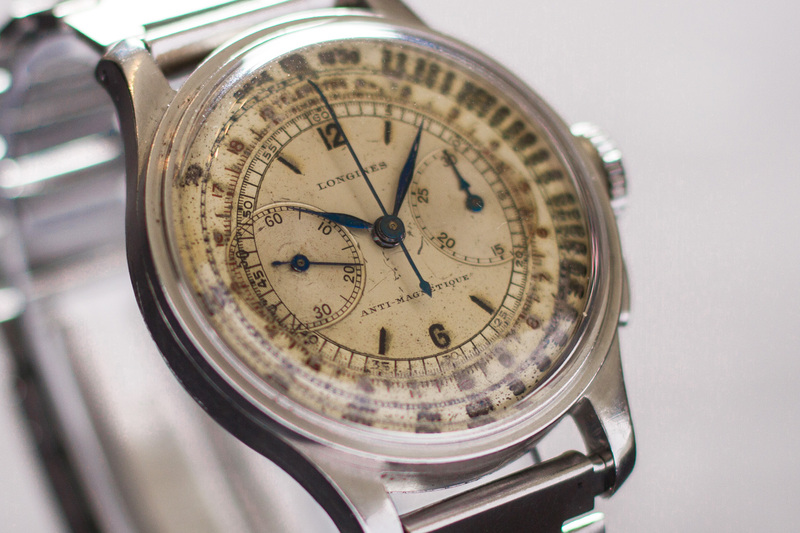 The ‘big eyes’ are an attractive feature when compared to smaller sub-dials on other chronograph watches. The wonderful blue hands on this Longines are still the original ones and the color was achieved by something that we now call Thermal Bluing. With Thermal Bluing the stainless steel hands are heated by a pile of brass scraps inside a small pan. Once the stainless steel watch-hands have been placed on top of the scraps, the heat generated through the brass will slowly turn the watch-hands blue, Now, this job is a painstakingly one and really requires some patience. For instance, if you heat up the watch-hands a bit too long they will turn too dark, maybe even black and you can start all over again with a new pair of stainless steel hands. You can probably imagine (especially in the 1940’s) that its extremely difficult to get all of the hands that exact same color blue using the above described method. 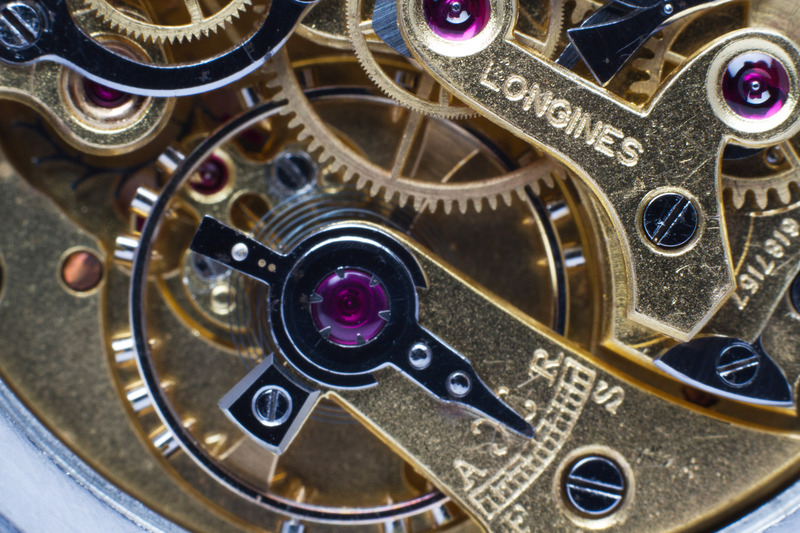 It is a job that was only done by the very best (master) watchmakers. Now, imagine the watchmaker who blued these hands back in 1942! Overlooking the Swiss Mountains, a small pan filled with brass, a flame underneath… That watchmaker has done an absolutely superb job and these original blued hands are as beautiful as ever!! During an 8 month period this 13ZN movement was completely overhauled in order to have the Chronograph Flyback working correctly again and we achieved a wonderful result! 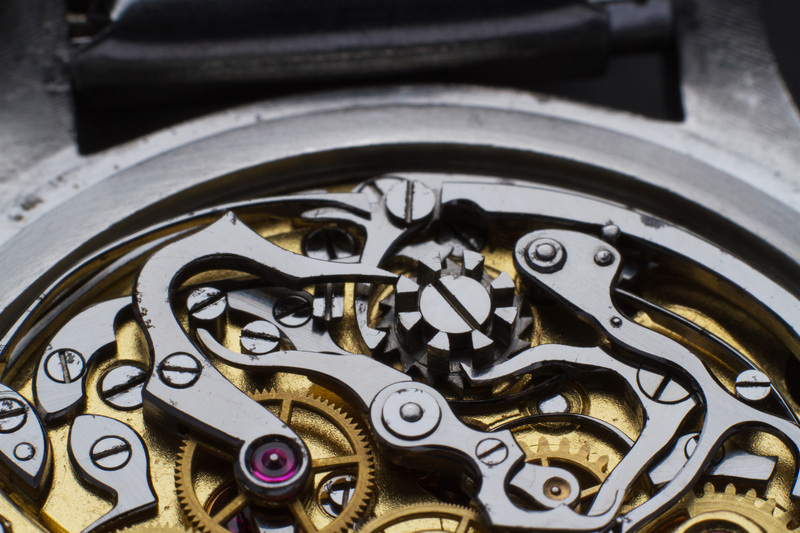 The movement is performing excellent with a fully functional Flyback Chronograph and perfect overall accuracy! There you have it! We’re happy to welcome you to our office for great coffee and some more Longines 13ZN talk. 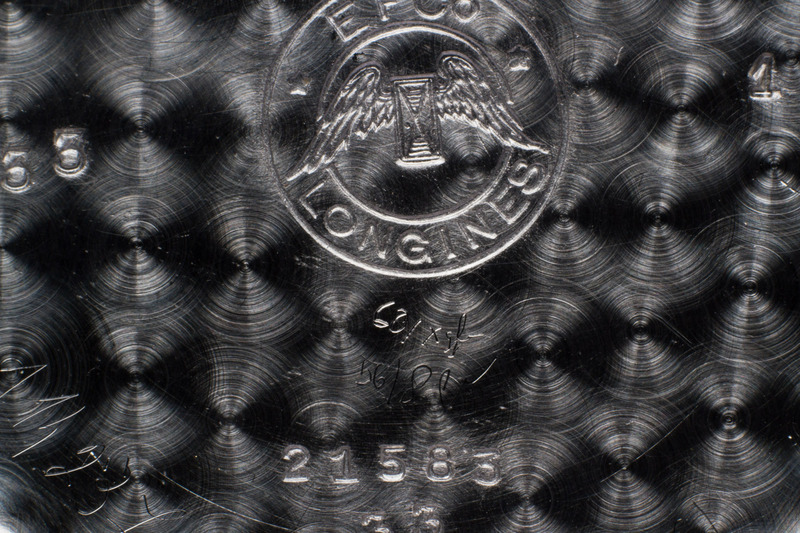 box and papers: This 13ZN comes with an extract from the Longines Archives.